Cashel family bible. See p.1 and p.2 and p.3. Cashel family tree by Robert D. Fleek (died 2002). Cashel family history documents by Brian von Konsky. 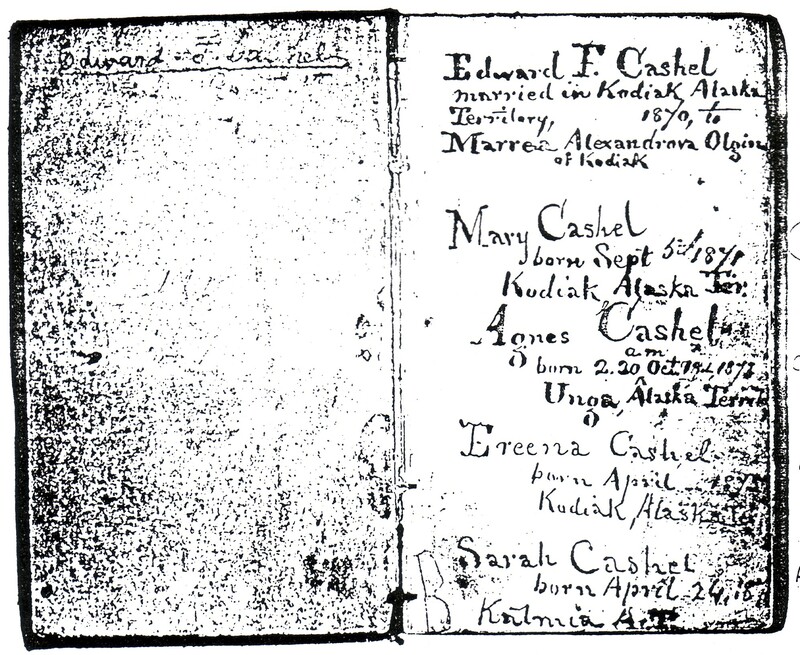 Cashel family history by Marti Murray, Aleut DataBank. 1907 poster of Alaska Pioneers' Association. Hangs in Juneau-Douglas city museum. Image from here. 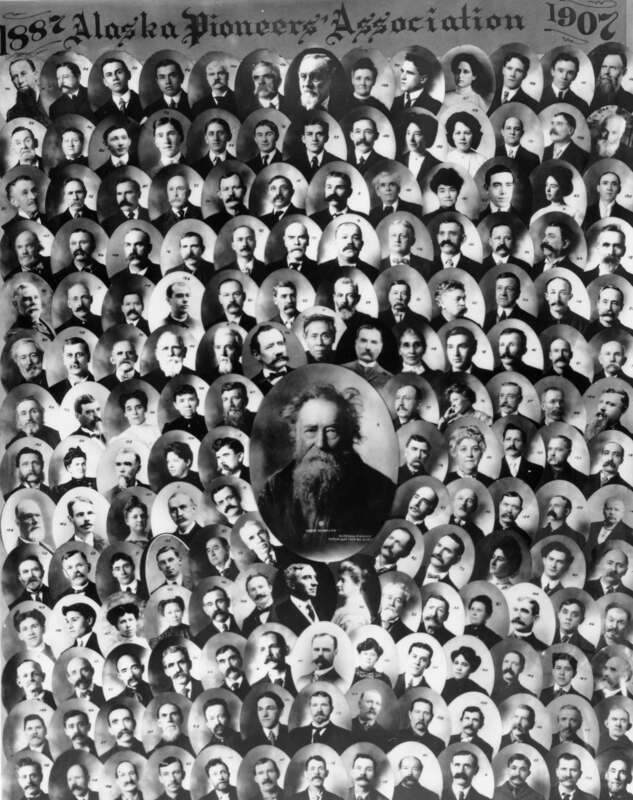 The Pioneers of Alaska was founded 1907 and admitted as "pioneers" anyone who was in Alaska before 1887. Unpublished memoirs of Lena Yarnell Reeve and others. "General Eli Lundy Huggins", by Carolyn Thomas Foreman, Chronicles of Oklahoma, Volume 13, No. 3, September, 1935. "Edward Cashel" in Canadian Genealogy Index, 1600s-1900s, which includes early Alaska. U.S. Army. Adjutant General's Office. Post Returns, Fort Kodiak (Alaska); June 1868 - Sept. 1870, Reel 585 of [NA.US] Microcopy 617. Also University of Alaska Anchorage, Archives and Manuscripts Department, Historical Manuscripts, HMC-0253j. Kodiak and Afognak Life, 1868-1870, edited by Richard A. Pierce, Alaska History No. 20, Limestone Press, Kingston, Ontario, Canada, 1981. See here. "Men and Things in Alaska", The Citizen, Minneapolis and St. Paul, November 26, 1874. Part of Cashel family bible. Edward, born Co.Tipperary, Ireland, bapt 14 June 1840. He grew up Mullinahone, Co.Tipperary. He went to America in 1860 or earlier. He is listed in [US Census, 1 June 1860] as living with his uncle William Kickham and family in Georgetown, Washington, D.C., he is listed as a "miller". Edward was living in Washington, DC (capital of the Union, the North) when American Civil War broke out Apr 1861. He signed up to fight for the North. He enlisted as a private in the Regulars. He was in Company G (also called Battery G) of the 2nd Regiment, US Artillery (U.S. Horse Artillery Brigade). He enlisted at Washington, DC, 8 May 1861, age 20 (right at start of war, he was volunteer, no conscription at this time). Listed as blue eyed, brown haired, with ruddy complexion, at 5' 10 1/2" tall. Enlistment incorrectly states Georgetown as his birthplace. Rather it was where he was living. Enlistment lists his occupation as a "miller". An estimated 200,000 Irish fought for the North, and 30,000 fought for the South. He was only a private, but was in an important Federal unit, which saw action in many of the biggest battles of the war. See Civil War battles of Edward Francis Cashel, July 1861 to Nov 1863. The North's campaign did not start up again after winter 1863-64 until May 1864. Edward's 3 years were up that month. He was honorably discharged at "the Wilderness", VA on May 8, 1864, for reason of Expiration of Term of Service. This was the day after the Battle of the Wilderness (May 5 to May 7, 1864). His military records say he was in the hospital at the time of his discharge. Though in 1864 letter he says he was never wounded. He wrote a letter on 20 May 1864 to his father George Cashel in Ireland. The war is still on, but his 3 years are up: "I have just returned to Georgetown from the Army in which I served 3 years. I was sworn in for 5 years, but Congress passed an Act that all persons who enlisted in 61 were to serve only 3 years". In 1864 he is staying again in Georgetown, DC, with "Uncle William and Aunt Jane". He said: "I have been in a great many battles, and thank God I never received a scratch or wound in the whole campaign". He was in 3 of the biggest battles of the war (Gettysburg, Chancellorsville, Antietam), front line, and some N lost, amazing no injuries. He asks "what William and Blen are doing". "Hoping you, brothers and sister enjoy good health" (mother obviously dead, and since this is apparently the first contact since he signed up in 1861, she prob. died before 1861). While Edward was away, Battery G was dismounted in June 1864 and sent to Washington. It had no more active service in the Civil War [Simpson, 1896]. Edward did not stay a civilian for long. He rapidly re-enrolled again, July 27, 1864, at Fort Cass, Arlington, VA, signing up for another 3 year period, again with Battery G, 2nd Regiment, US Artillery. American Civil War ended May 1865. Edward deserted for one day, July 31, 1865, and was apprehended August 1, 1865. He was restored to duty without trial. The 2nd Regiment, US Artillery, was assembled at Fort McHenry, Baltimore, Maryland, in August, 1865, and sailed from there for California via the Isthmus. The 2nd Regiment arrived San Francisco Sept 1865. Set up headquarters at the Presidio, San Francisco [Simpson, 1896]. 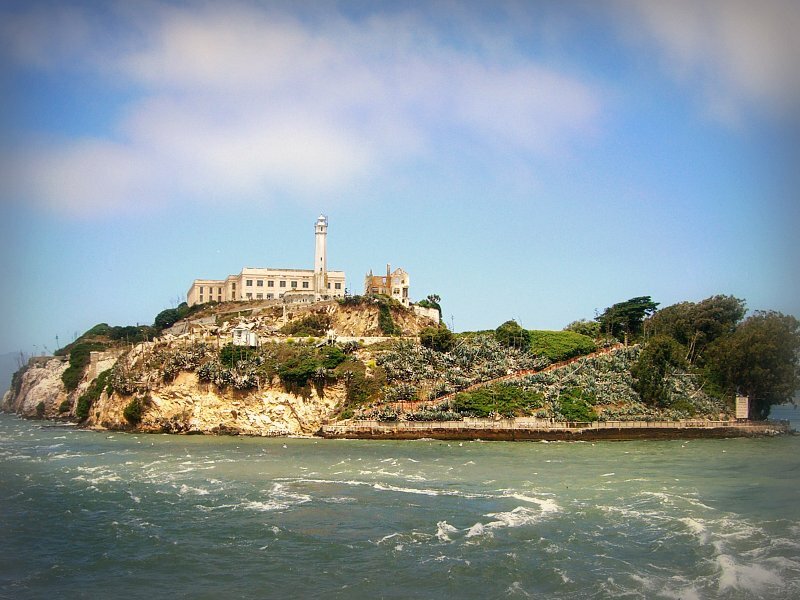 Battery G were based at Alcatraz Island, San Francisco. Edward was promoted to Corporal (just above Private), 1 Jan 1867. He was honorably discharged from his 3 years service on July 27, 1867 at Alcatraz Island, San Francisco. He immediately signed up for another 3 years service, July 27, 1867, again with Battery G.
He was promoted to Sergeant 1 Sept 1867. He was sent with Company "G", 2nd Regiment, US Artillery, in 1868 to the new US territory of Alaska. He had rank of quarter master sergeant. Would need some education (maths) to hold that post. [Foreman, 1935] says that after U.S. purchase of Alaska 1867, Eli Lundy Huggins (joined 2nd Artillery Feb 1866) received orders to conduct "Battery G" from their post at Alcatraz Island, California, to Kodiak, Alaska. The first U.S. troops arrived at Kodiak spring 1868. Huggins joined them 6 June 1868. 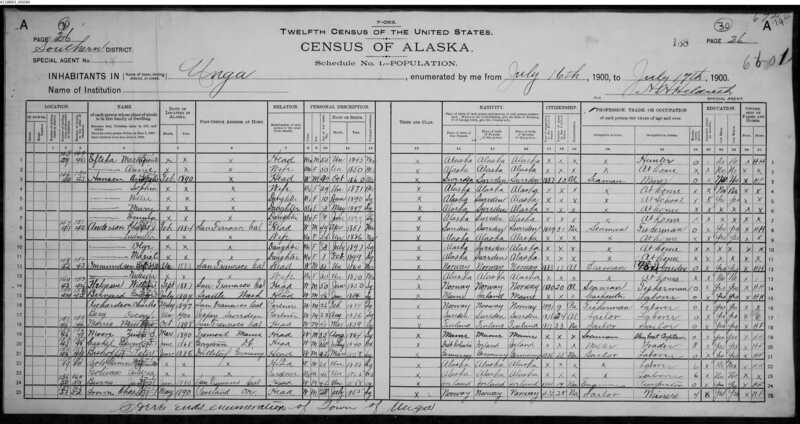 [US Census, 1900] says Edward arrived in Alaska June 1868. Russia established settlements in Alaska in the 18th century. See Russian colonization of the Americas and Russian America. Alaska was purchased by U.S. from Russia 1867. It was inhabited at this point by a few thousand Russian settlers and the natives. Relations between Russians and natives varied from exploitation to trade to friendly inter-marriage and conversion to Christianity. A Russian fort and small Kodiak village existed at Kodiak when the Americans arrived 1868. Edward served at Kodiak under Eli Lundy Huggins. Battery G built the new Fort Kodiak at the pre-existing Kodiak village and Russian fort. The aim was "to prevent, in the absence of any organized civil government, any abuse by the settlers, traders and fishermen upon the natives of the Island, and second, to keep in check and overawe, by an exhibition of military force, the more barbarous natives of Kenay and Alaska Peninsula, who visit Kadiac [Kodiak] for purposes of trade." [Huggins, 1874]. A letter of Aug 1868, sold in a stamp auction 2004, calls it "Kodiak, Alaska Territory, Russia America", "the only known letter addressed to Russia America". William Kickham writes a letter to George Cashel, Feb 1869. He says: "I had a letter from Edward .. he is at Fort Kodiak, Alaska Territory". Edward's letter was posted Alaska Dec 1868, sent by steamer to "San Francisco, California" (note he names the state - George mightn't have heard of San Francisco, then just a small town) and then E across the continent to Georgetown, DC. "the letter was over 50 days coming here". Huggins stayed with Battery G at Fort Kodiak until June 22, 1870 when he was assigned to St. Paul Island, Alaska. Edward did not stay in contact with home. His brother Blen went to the great expense of actually going to the US to look for him in 1870. Blen received a dispatch from US War Department, addressed to him in New York City, 9th July 1870: "In reply to your communication of 29th June 1870, I have the honor to inform you that Edward F. Cashel, Qr.M.Sgt, of Co.G, 2nd Regt US Artillery .. [is with his Co. at] .. Fort Kodiak, Alaska Territory". Edward was honorably discharged as Sergeant at Fort Kodiak, July 27, 1870 for Expiration of Term of Service. He left the Army. Battery G left Fort Kodiak Sept 1870. Fort was abandoned by army, but village continued and became Kodiak city. Troops were sent to a number of other places in Alaska, but by end 1870 all these bases (including Fort Kodiak) were closed except for Sitka. Huggins rejoined Battery G at the Presidio, San Francisco, November 19, 1870 [Foreman, 1935]. Edward stayed in Alaska. He lived Kodiak, 27 July 1870 - 15 May 1871 [pension records]. Edward mar 4 Sept 1870 to Marre-a Olgin [Marre-a Alexandrova Olgin, thus spelt in [Cashel family bible]]. She is possibly Ol'gin, think NOT Mare-a or Maria or Mariia, think NOT Alexandrovia or Aleksandrovno. She was a Russian settler in Alaska. She was born 30 Mar 1848 (18 Mar according to the Julian calendar used in Russia) in Kodiak, dau of Aleksandr Vasil'iev Olgin (or Aleksandr Vasil'Evich Ol'gin) and Irina Platonova Bushkovskii (or Irena). See her ancestry. Native American ancestry: Her grandmother was apparently Aleut (Native Alaskan). [Marti Murray] says she had the designation "Creole", which would mean a combination of Russian and Native. Some Russian settlers left after America bought Alaska, but many stayed. Marre-a was Russian Orthodox. They married in the Russian Orthodox church. [Marti Murray] lists Edward as "Protestant", but think this is not true. He was born Catholic. He had his children baptised in the Russian Orthodox church though. [Russian Orthodox church records] say they mar 23 Aug 1870 according to the Julian calendar. This is 4 Sept 1870 new style. NOT 25 Sept.
Church record says they mar in Kodiak Island parish (this is probably the Church of the Holy Resurrection, Kodiak, Alaska). Mar cert is apparently in Russian. They possibly married on Spruce Island in Kodiak parish. Edward and Marre-a lived on Unga Island (the largest of the Shumagin Islands), Alaska, 20 May 1871 - Apr 1874 [pension records]. 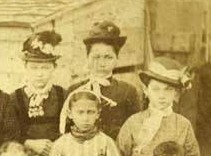 They lived Kodiak, Apr 1874 - 1878 [pension records]. They (and later just he) lived Unga, 1878 to at least 1907 [pension records]. Edward worked as an agent for the Western Fur and Trading Company (estab 1877). He is listed as a "Storekeeper" in Unga for them [Reeve]. He later worked as an agent for the Alaska Commercial Company (which purchased the Western Fur and Trading Company 1883). He was their agent as at 1884. Gold was discovered on Unga Island in 1884 and there was a boom for many years. Marre-a died 12 April 1884, Unga Island [pension records], age 36 yrs. [Russian Orthodox church records] say "Mariia Keshal" died 1 Apr Julian (which is 13 Apr new style). They say she died in Belkofski parish. Belkofski is just W of Unga (see map). Belkofski parish might include Unga. After his wife died 1884, it looks like Edward failed to give the children a proper education. 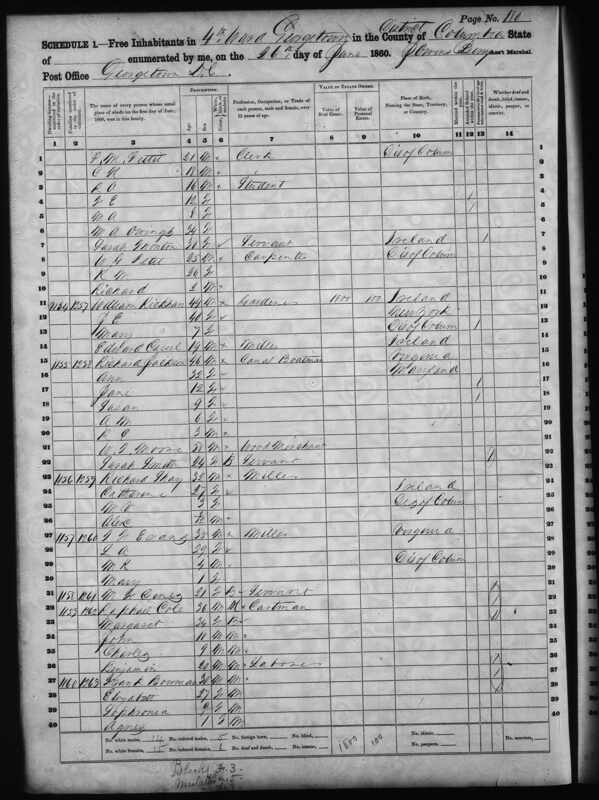 He was able to read and write himself, but his children Sarah and Edward are both listed as illiterate in the 1900 census. [Reeve] lists Edward as "well educated" and "hard drinker". 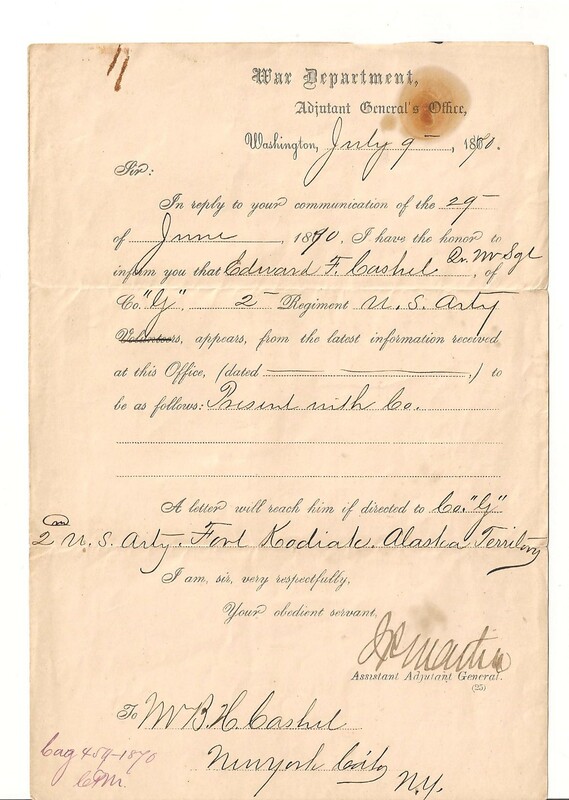 He applied for U.S. Army pension, 31 July 1893. He applied for U.S. Army pension, May 24, 1895. He applied for U.S. Army pension, April 8, 1898. See US army pension record, filed 24 May 1898, and 18 Oct 1907, [NA.US] T289. He is listed at Unga in [US Census, 1900], lists him as "trader", former occupation "miller". It incorrectly states he was born D.C. He was a pensioner on the U.S. Army pension roll, #1037181, living Unga, as at 1907. He died Dec 1909, age 69 yrs, on Simeonof Island, Shumagin Islands, Alaska [Reeve], [Nancy von Konsky], think NOT Unga. [Russian Orthodox church records] say bapt Kodiak Island parish, 26 Aug Julian, which is 7 Sept new style. mar Adolph Garn and had issue. 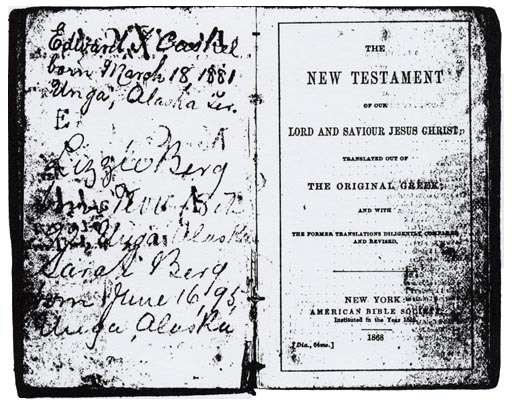 she is not listed in Edward Cashel's list of living children in his pension application 1898.
mar 7 Sept 1891, Unga [her age 15, him age 32] to Andrew Berg [born 14 Oct 1858] and had issue. [US Census, 1900] says born July 1882. Edward's baptism in Ireland in 1840. Edward Cashel living with his uncle William Kickham at Georgetown, D.C., in 1860 census. 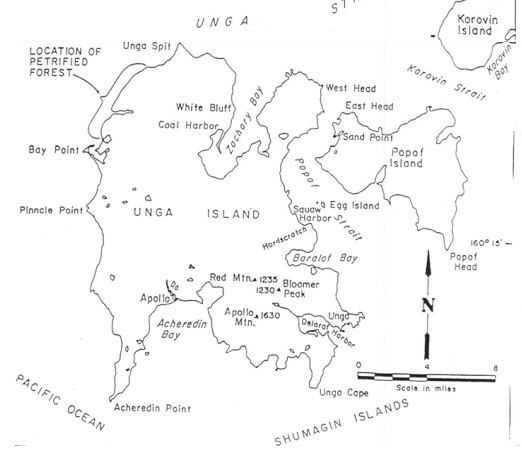 The incredibly remote location of Unga Island, Alaska (home of Edward Francis Cashel). Note locations of Apollo mining camp and Unga village. The Cashel children and their Olgin relations. From Alaska State Library, Michael Z. Vinokouroff Photograph Collection, reference ASL-P243-1-113. Used with permission. See larger and larger and full size. "Maria Cashel" (born 1871), "Agnia Cashel" (born 1873), "Sarah Cashel" (born 1876). Various members of the family are buried in graveyards in Douglas, Alaska. 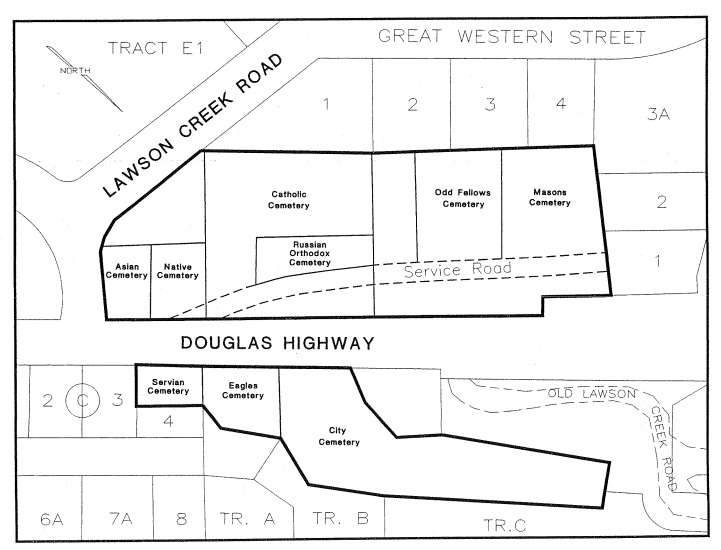 A useful plan of the graveyards in Douglas, Alaska. Posted at findagrave.com by Jennifer Wirawan. Blen Cashel made an extraordinary trip to America in 1870 to try to find his brother Edward. Amazingly, 132 years later, in 2002, the Internet brought the two sides of the family together again. Edward Francis Cashel's family back in Ireland had so little news of him that his brother Blen went to America in 1870 to try to find him. Blen got to New York, where the US War Department told him that his brother was in "Alaska Territory", an impossible distance away. He almost certainly never saw his brother again. 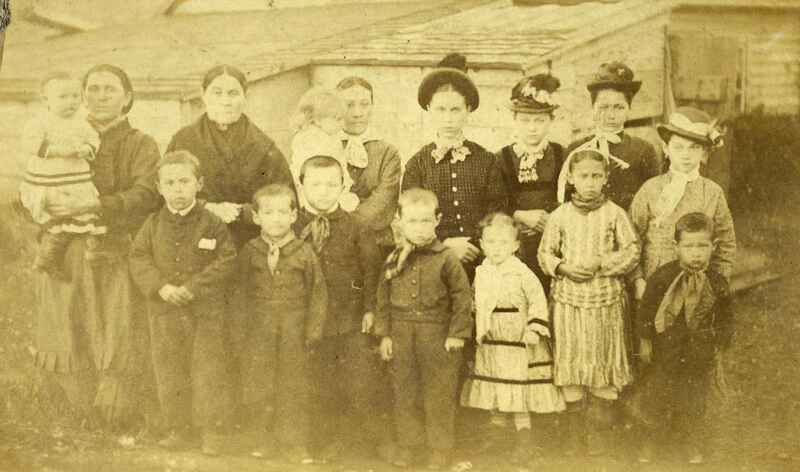 It is thought that after this last contact in 1870, Edward was never heard of again by the family in Ireland. It was known that he married a "Russian girl" and that was it. Snapshot of my website in 1999. For many years, this was all the family in Ireland knew about Edward. But then, in 2002, his descendants discovered my website, and the two sides of the family made contact again after 132 years. Unga Island is now uninhabited. See satellite view of the abandoned Unga village on Delarof Harbor. Edward James Cashel (email defunct) of New Jersey, born 1952, son of John Edward Cashel, says his father is grandson of "Edward Francis Cashel who was in the Civil war". Says he is related to the Cashels of Hopewell, New Jersey. The following Cashel is found coming from Russia to Britain. 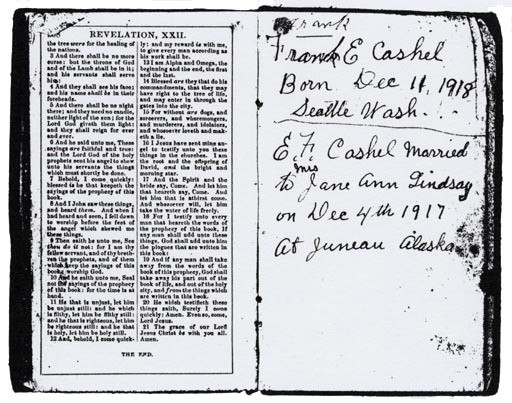 No reason to believe anything to do with Edward Francis Cashel. This Cashel may have been born something else and changed his name on arrival in Britain. listed in [UK census, 1901] as "cabinet maker", single, living as boarder in 23 North Place, "Mile End New Town", London. This is the W part of Mile End, near Bethnal Green, E end of central London. In map of 1827 North Place is shown just off Back Lane, just off Green St, just E of Bethnal Green. In map of 1848 (from here) Back Lane is now Globe St.
On modern map, North Place is now Kirkwall Place. Back Lane / Globe St is now Globe Rd. Green St is now Roman Road. Cashel is listed as living with a lot of other arrivals from Russia. 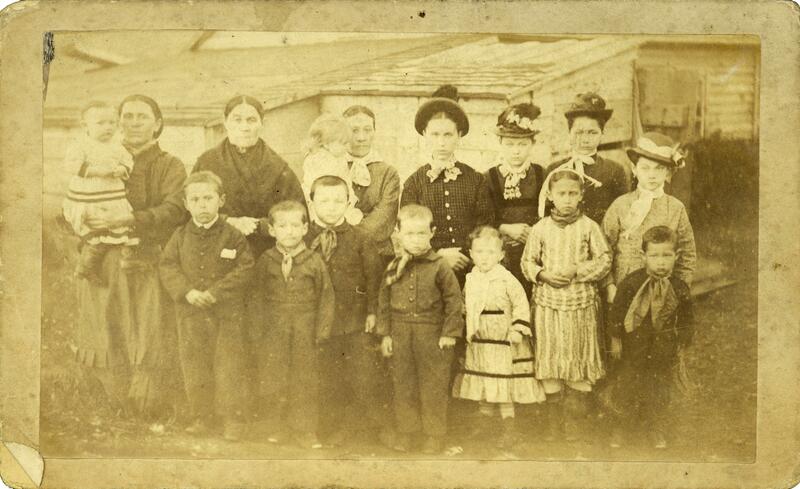 Many Russians (especially Jews) came to the East End of London at this time.